I have just learned of Pat Browning's death. I met Pat at DorothyL, and we became fast friends. She was as proud of Whimsey: A Novel as I was. I will miss her more than I have words. Patricia Lucas Browning was born September 3, 1926 in Weleetka, Oklahoma to Frank and Willa Lucas. She grew up in rural Oklahoma and graduated from Oklahoma A&M College in Stillwater, Oklahoma in 1949. She then taught English and Journalism in Sapulpa and Cleveland, Oklahoma high schools. Patricia lived in Hanford, California from 1956 to 2005 when she moved to Yukon, Oklahoma until 2013. She then lived in California until her death in Hanford on February 2, 2015. Browning was married to Leo Cokely from 1957 until his death in 1983. She was married to Clarence Edward Browning from 1986 until his death in 2003. Browning's professional writing credits go back to the 1990s when she was a stringer for The Fresno Bee while working full time for nearly 20 years in the Hanford law office of Rosson and Pearson. 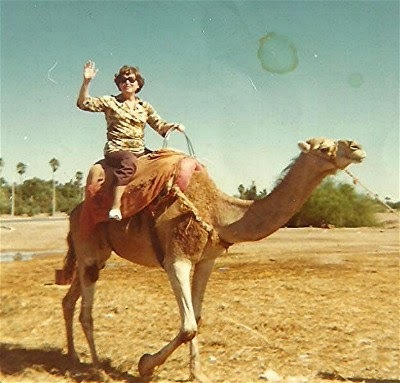 Her globetrotting in the 1970s led her into the travel business, first as a travel agent, then as correspondent for TravelAge West. In March 1986 Browning became Manager of the Hanford Improvement Association. In the 1990s, Browning signed on fulltime as a newspaper reporter and columnist, first at The Selma Enterprise and then at The Hanford Sentinel. Her feature writing won several awards at both newspapers. She self-published a mystery entitled "Full Circle", which was later re-issued and renamed, "Absinthe of Malice". At the time of her death, she was working on a second book. Browning is survived by her brother Tom Lucas (Cristal) of Norman, Oklahoma, sister-in-law Jeanelle Lucas of Norman, Oklahoma, sister Beth Ridle (Louis) of Juneau, Alaska, Sister-in-law Ginger Lucas (Frank) of Akron, Pennsylvania, stepsons Gordon Browning (Jane), Jerry Cokely (Barbara) cousins, Tim (Kim) McElhannon of Visalia, CA; and numerous nieces and nephews. Burial will be in Erick, Oklahoma. Truly sorry to hear this. Another star gone dark. So, so sad to hear about this. I was hoping to see her again. I felt Pat's support throughout my mystery writing career. Thank you, Pat. My heart is heavy after hearing about Pat's leaving us. She was a special person.